The owner of Humberside Airport has announced it is planning to sell its stake in the business. Manchester Airports Group (MAG) said it wanted to sell its 82.7% share to focus on its larger airports - Manchester, East Midlands and Bournemouth. The news surprised North Lincolnshire Council which owns the remaining 17.3% of Humberside Airport. Council chief executive Simon Driver said the local authority "now needed to consider its position". A spokeswoman for MAG admitted that its decision had left an uncertain future for the 730 people who are employed by a variety of companies based at Humberside Airport. "It is a great airport, it returns a profit but we feel it needs somebody else to take it forward as we concentrate on our core business at our other airports," she said. "We have grown the business since taking over in 1999 and we would hope that would be the case under new ownership. "However, it is difficult to say how someone else is going to run the business." MAG chief executive Geoff Muirhead said: "Humberside Airport is a solid business but the attention needed to maximise its full potential may not fit easily with the group's emerging strategy. "The Humberside Airport team has done a fantastic job retaining and attracting airlines and maintaining stable passenger numbers, particularly during the last few years when competition has increased significantly." Mr Driver said: "North Lincolnshire Council welcomes the long-term relationship with Manchester Airports Group and recognises that now is the time to look to the future. "We will build on the success of the airport for the benefit of North Lincolnshire and the wider region. "The airport has real potential and the council, as a shareholder, will look to maximise the development of the airport in the future. "The council has maintained its shareholding in the airport since 1996. "In light of the news from Manchester Airports Group, the council now needs to consider its position. It is inappropriate to comment further at this stage." Since buying its majority stake in Humberside Airport in 1999 for £10m, MAG has invested nearly £7m to improve and develop the airport's infrastructure. Routes currently served from Humberside include Air France/KLM's worldwide hub at Amsterdam, many popular holiday destinations, including the Canaries, Lapland and the Channel Islands, and domestic services to Scotland. 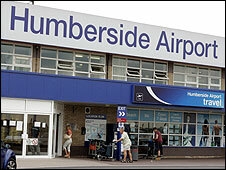 Government forecasts indicate that Humberside Airport is expected to handle about one million passengers every year by 2016.